Learn the English Confiteor with audio downloads and Catholic worksheets. We pray the Confiteor prayer at Mass. 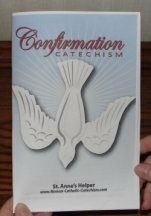 It is often required while preparing for Confirmation and when altar boys are learning to serve Mass. The term is the first word in the Latin prayer, but also indicates the English that means "I confess". See the Latin and English below. Therefore, I beseech Blessed Mary, ever Virgin, Blessed Michael the Archangel, Blessed John the Baptist, the Holy Apostles Peter and Paul, and all the Saints, to pray to the Lord our God for me. Amen. Confiteor Deo omnipotenti, beatæ Mariæ semper Virgini, beato Michaeli Archangelo, beato Ioanni Baptistæ, sanctis Apostolis Petro et Paulo, omnibus Sanctis, et tibi, pater: quia peccavi nimis cogitatione, verbo et opere: mea culpa, mea culpa, mea maxima culpa. 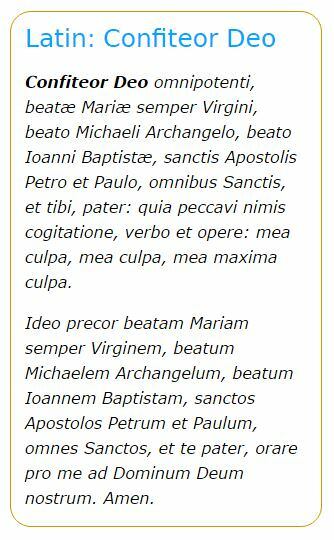 Ideo precor beatam Mariam semper Virginem, beatum Michaelem Archangelum, beatum Ioannem Baptistam, sanctos Apostolos Petrum et Paulum, omnes Sanctos, et te pater, orare pro me ad Dominum Deum nostrum. Amen. It is also like an Act of Contrition before or during Confession in the Sacrament of Penance (Catholic Reconciliation) and in the sacrament of Extreme Unction. It calls on aid of the Blessed Virgin Mary, St. Michael, St. John the Baptist, and St. Michael. It is certainly a consolation to have these great members of the Communion of Saints praying for us! It is a prayer that asks for forgiveness and when it is said during the Mass it is said in Latin. Altar boys need to learn it in order to serve. It is the longest altar boy response. Once a boy learns it in Latin the hardest prayer is finished. It can be tricky to get the endings right; beware the second half in Latin! When saying the triple mea culpa one strikes his bosom three times in sorrow for his own fault in his past sins. "Mea culpa" is a famous term meaning "My fault". People use it outside praying, too. The "I confess" is easy to learn. Simply repeat it often. 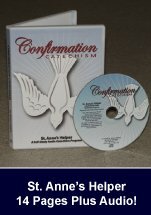 St. Anne's Helper offers it in English in the audio version of the Confirmation Catechism as well as in the Catholic Confirmation worksheets in the Catechism Copybook for easy repetition and handwriting practice. See below.